Why is the 7.0 cu. ft. GE chest freezer (GE FCM7SUWW) a customer favorite? It has a compact footprint that's ideal for tiny apartments or narrow kitchens. Customers also love its energy efficiency. Because it's a manual defrost, it uses far less energy than identically sized upright freezers. Plus, it's established an enviable track record as value for money. (To get a sense of this, head over to Home Depot and confirm for yourself that nearly 1,500 happy customers have given it the perfect score—5 stars out of 5!). Compact chest freezers are especially great for anywhere where space is at a premium—tiny apartments, dorm rooms and even the pantry. 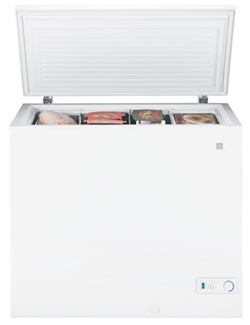 Height with lid open: 53"
As one of the smaller chest freezers on the market today, it's probably your best bet if space is a major consideration. Just remember to allow for 3" back and side air clearances when measuring its designated spot. And it weighs only 91 pounds, making it easy to haul into and move around the house as needed. The GE FCM7SUWW offers a modest capacity of 7.0 cu. ft. but it's still big enough to help singles and small families rake in considerable savings by stocking up on sales. What's even better, these baskets can be slid back and forth in order to help you locate food on the freezer floor without any backbreaking lifting. They can also be lifted out completely in order to create room for oddly shaped items. So of course, if you want it to keep functioning well, you need to take time out to manually defrost your freezer when ice builds up. This is admittedly tedious but you only have to do this once every 18 months, may be. And at least the defrost drain helps to channel the waste water so that you don't have to mop up afterward. This GE 7.0 cu. ft. chest freezer uses just 277 kWh of energy each year. In plain English, you can expect it to cost you about $25.00 in the energy department each year. That's just over $2.00 each month. Who doesn't want to rein in a runaway electric bill, especially in these hard economic times? In order to keep costs down, many manufacturers skimp on compact chest freezer features. Surprisingly, some of the features that are frequently sacrificed are some of the most important, such as a power on light. Fortunately, the GE FCM7SUWW is the exception to the general rule and comes with a power on light. So you can get the assurance that your freezer is still working with a quick glance. The GE FCM7SUWW has a temperature dial which is a great tool for adjusting the freezing conditions of your food. For example, after introducing fresh produce such as meat and veggies, it's advisable to set the temperature to a colder setting in order to lock in the juices and freshness. What's more, the temperature control is mounted on the freezer exterior. That way you don't have to keep opening the freezer (and consequently warming your food) just so you can adjust the temperature. This 7.0 cu. ft. GE chest freezer looks solid and has a sturdy feel to it. It's all-white and is a great choice if you are looking to brighten up your kitchen. It has a recessed handle that isn't just stylish as it doesn't stick out like a sore thumb, it reduces tripping accidents around your home. This 7.0 cu. ft. freezer joins a long list of GE's legendary products. So you can be sure that it's designed with the meticulous attention to detail that GE is so famous for. Yet things can still go wrong. In effect, GE undertakes to remedy defective parts and poor workmanship that existed at the time of purchase. Just be sure to keep your receipt in a safe place should you need to invoke the warranty. The recommended retail price for the GE FCM7SUWW is $249.00. Given the freezer's potential to help you rake in massive grocery savings, this is already quite a steal as it could pay for itself in just a few months. But it's possible to get additional savings off at some of the major appliance stores. And renowned ones—like Home Depot—can deliver it for free and even haul away your old freezer, also free of charge! Is the 7.0 cu. ft. GE Chest Freezer Value for Money? “Very sturdy and well put together, it does not look flimsy at all. This also runs nice and quiet." “Just the right size for a small household with a prodigious garden like mine. Lots of room, but not too big to lose things or hog energy. No fancy features, just good frozen food storage." “This is a no frills chest freezer. It has everything that I was looking for. Sliding baskets for easy access to the lower part of the freezer is a big plus...This freezer is great for keeping your ice cream frozen (and I do mean frozen)." Methinks there's a flimsiness—in the price, though.